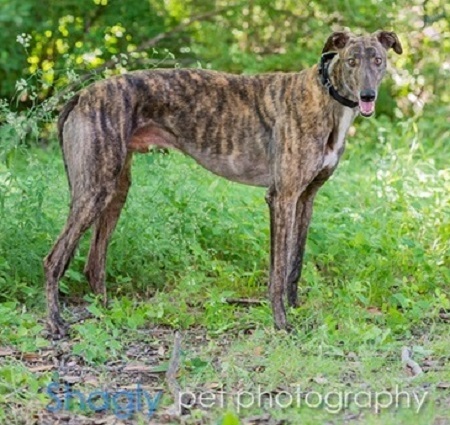 Hoss, aka Kiowa Hoss Henry, is a 3-year-old dark brindle male born April 14, 2011. His sire is Wigwam Hoss and his dam is Kiowa Olivia. 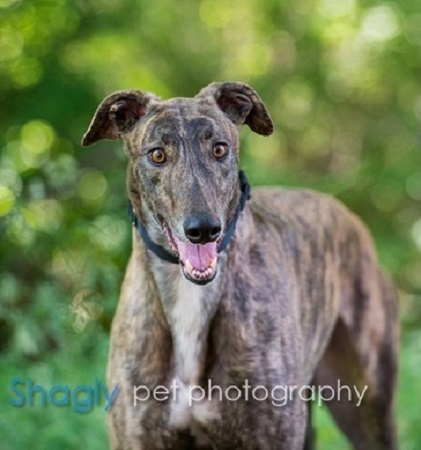 He has 38 races on record at Greyhound-data.com all in Florida, starting in December 2012 and finishing up in February 2014. He's going to be a wonderful pet! Hoss should not live with cats. Hoss was very timid and unsure of everything when he came to our house. However, since then, he has embraced living in a home and retirement whole-heartedly. He is one of the calmest dogs you will ever meet (unless you have food/treats). He likes to go on walks, he loves his bed(s). He is a lover. He wants to be where you are and likes to be petted. He rides well in the car – as long as he can get comfortable, he lays down and takes the opportunity to take a nap. He handles teeth brushing and bath time like a champ.